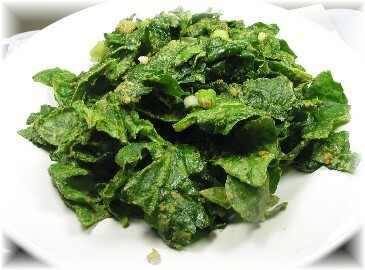 Place dried spinach into a bowl and spread the leaves out. Cut onion into rings, and mix into the spinach. 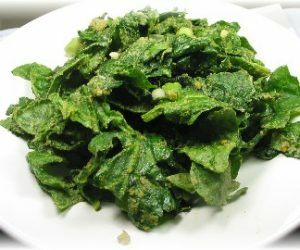 Cut up dandelion leaves into 1 -inch strips and add to dish. In a lightly oiled frying pan over medium heat, saut6 garlic cloves until slightly brown. Allow a few minutes for garlic to cool, then cut into strips or rings and add to dish. Add sprouts, and sprinkle on turmeric and sea salt to taste. Sprinkle on olive oil. Serve immediately, or refrigerate and serve later.